The show’s DNA explains its award-winning success. Photography – Photo by Matthew Murphy. The holidays are behind us, and February continues the ramping up of indoors offerings so Central Iowans can experience the unique thrills of live theatre arts. “Dear Evan Hansen” opens Feb. 5 for a week, part of Des Moines Performing Arts’ (DMPA) signature Willis Broadway Series. In another coup for DMPA, Iowa’s capitol city hosts this national tour even before Chicago. This show’s DNA explains its award-winning success: book by Steven Levenson (Tony Award winner), score by Banj Pasek and Justin Paul (Grammy, Tony and Academy Award winners, “La La Land,” “The Greatest Showman”) and direction by four-time Tony Award nominee Michael Greif (“Rent,” “Next to Normal”). This compelling musical revolves around a young man with a social anxiety disorder. He craves a connection with his peers. The death of a fellow student provides Evan Hansen an opportunity. He fabricates a relationship with the boy, who had committed suicide. 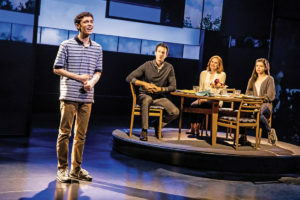 The lie keeps spinning into greater complications, leading Evan Hansen to make an inevitable ethical choice between truth and lie. That teaser quote, plus the strong reputation of ISTC in their quality production and performance values, means that ‘Lion’ holds great promise for delivering a taut, dynamic theatrical experience. This story draws several distinctive characters together for a holiday gathering. Wilson shares his attraction to this script. “You’re a Good Man Charlie Brown” opens Feb. 15, the next Des Moines Young Artists’ Theatre show, giving local audiences the opportunity to dive into the humor, wisdom and life lessons as conveyed by Charles M. Schultz’s beloved “Peanuts” characters. Under the co-direction of Libby Waterbury and Adam Yankowy (also serving as the musical director), and choreography by Marco Masteller, this show will vibrate with energy and talent. DMYAT has a well-deserved reputation for bringing in top production team talent, and “Charlie Brown” is another such show. What separates this version of the show from others is that DMYAT fills the cast with talented youth, often from many different area schools. This organization has become a creative magnet in giving young, aspiring performers a platform on which to excel. The results are rewarding for those involved in productions and for the appreciative audiences who experience such unbridled exuberance.